Malcolm Fraser, The ANU 2007 Commonwealth Lecture - Australians: What are we? How do we see ourselves? How do others see us? 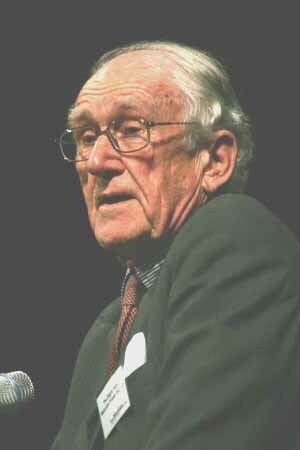 In retirement, former Prime Minister Malcolm Fraser became a fierce critic of John Howard's asylum seeker treatment and policies. Delivered before 500 staff, students, and journalists, Fraser delivered a passionate speech, comparing Australia during his prime ministership with modern times. "In Australia political parties did not play politics with race or religion." "They knew the world had to do better if civilization was to survive." 4 December 2005: Malcolm Fraser: Human Rights and Responsibilities in the Age of Terror - "The fact that the Government, with the support of the Opposition, has moved so far away from the Rule of Law demonstrates the fragility of our grasp of a liberal, democratic society. If we stand silent in the face of discrimination and in violation of the basic principles of humanity, then we betray our way of life." On 21 March 1975, Fraser became the Leader of the Opposition and on 11 November 1975, following the dismissal of the Labor Prime Minister, he was appointed Prime Minister of a Caretaker Government pending the outcome of a General Election. Fraser's government was subsequently re-elected in the two succeeding elections, in 1977 and 1980. On 25 February 1983 Fraser became Australia's second longest serving Prime Minister. Fraser resigned from the Parliament in April 1983 after nearly 28 years as the Member for Wannon. Fraser was Chairman of CARE Australia from 1987 to December 2001. He was President of CARE International from 1990-1995, and was Vice President from 1995-1999. The Human Rights and Equal Opportunity Commission awarded Fraser the 2000 Australian Human Rights Medal. My remarks today will reflect on relationships with the United States and domestic issues, which influence the fundamentals of Australia. There has in recent times been a major attack on traditionally accepted Australian values. This also impacts on our reputation in our region and in the wider world. This is particularly damaging because the Bush government is on the way out and, within the United States, those who have supported it strongly will, in the next Administration be regarded as pariahs. This is also likely to apply to the current administration's closest and most unquestioning allies. Policies now applied suggest that the Rule of Law and due process for all people, regardless of influence, race, religion, colour or country of origin, is under threat. We used to believe that those in positions of political authority would respect and work to protect the rights of all Australian citizens. We now know that to be naïve and incorrect. I would like to recall some changes that have taken place in the last half century. The post war years were the beginning of a new age of enlightenment despite some serious backward steps. In spite of the difficulties and rigours of the Cold War and the dangers that that involved, much greater than anything we face today, it was an optimistic period. The United Nations, the World Bank and the International Monetary Fund were all established, collectively designed to establish a fairer and a more peaceful world. Colonialism would be outlawed. People would look after their own affairs. The techniques of modern economics gave hope to governments worldwide, that unemployment could be banished. The Universal Declaration of Human Rights came into being in 1948. Many Conventions were negotiated, designed to give legal force to its high aspirations, including the Refugee Convention which Menzies signed onto for Australia in 1954. In Australia political parties did not play politics with race or religion. Political leaders of those years, both in Australia and in many overseas countries had experienced the depression of the 1930's and the terrors of the 2nd World War. They knew the world had to do better if civilization was to survive. They in effect established a new and more liberal age, a time of hope and optimism, a new enlightenment. It was recognised that on sensitive matters of race and religion, those in authority had to give a lead and make decisions and that it could be unwise to ask for a popular vote. If the people of Melbourne had been asked if they wanted their city to become the biggest Greek city outside Greece, they would then have voted no. Now that it has happened they would overwhelmingly vote in favour of it. If we had asked Australians in 1975/76 if they wanted to accept large numbers of Vietnamese and others from Indo-China, refugees from the war in which we had been an active participant, they would have said no. They would have been fearful of difference. The governments argued on ethical grounds that we had no option and broadly that was accepted. In these years we did not have detention centres, which should more properly be called jails, because they have all the necessary attributes. Refugees were in the community, able to buy coffee, able to work. Because they seriously wanted a new home, they were not going to abscond. It was an open, liberal society. Multiculturalism came to be accepted. Every migrant group that I have met has always placed Australia first, understands the necessity to abide by Australian laws and customs, but appreciates, I believe, the openness with which their old customs can still be celebrated. We really believed in strength through diversity and that the acceptance of diversity would bring Australians closer together. What led to change? In the middle to late 1980's a debate was started about Asian immigration. At the same time a Labor Minister for Immigration decided new boat people should be placed in what he called detention centres, in jails. The Liberal Opposition accepted that fundamental change. The harshness of our refugee regime begins from that point. It has been fine tuned and made significantly more inhumane in the years since. Pauline Hanson came on the political stage. Many roundly condemned her for saying turn the boats back. When the current Government turned the boats back, it won the Tampa Election, a substantial change in attitude. An undeserved respectability was given to Pauline Hanson's words. We had forgotten that the right to free speech is not absolute. Without a sense of responsibility, of community, and of judgement, free speech can become divisive and destructive, as it has in relation to race. One of the small reasons for change is that now opinion polls often drive policy. Both the Government and Opposition use their internal party pollsters on many issues to find out the basic views of Australians. Such polls can lead to extraordinary error, especially if the questions asked are ones about which there has been no public debate and which are therefore likely to attract an emotional and not a considered response. But all of this is not enough to justify or to explain the changed attitudes. Why have governments chosen to follow and not lead? Political events in the Middle East and also Afghanistan were causing large numbers to flee. Upwards of 400,000 were arriving in Europe each year. 4, 5 or 6,000 came to Australia. At the time the Government was not doing well in the polls. It certainly needed an issue. The defence of Australia's borders, proclamations about deciding who would come here or who would not, sought to arouse a chauvinistic response. Boat people were demonised as evil, as queue jumpers, as prostitutes, as drug peddlers, even as potential terrorists and as having no appropriate family values. I don't believe there was ever an explanation of the terrors from which these people fled, of Afghan families wanting a life for their female children knowing they would have none in a Taliban dominated Afghanistan. A father in such a family, if he had initiative and enterprise would do everything he could to get that family out of Afghanistan. We sometimes forget the Tampa occurred before 9/11, much longer before the invasion of Iraq. The possibility of terrorists coming to Australia on refugee boats was only raised after 9/11. The terrible events in the United States of 9/11 occurred a couple of weeks after the SAS were placed on the Tampa. From these points on the politics of fear dominated the domestic environment. What we do not know we often fear. What we do not understand we fear. People from a different religion we often fear. And what we fear becomes a threat. The politics of these issues was exploited by the Government and has bitten deeply into the Australian psyche. This reminds me of the bitterness, even hatred, between Catholics and Protestants generated by Prime Minister Billy Hughes during the First World War. His actions over the conscription debates in attacking the Catholic Church and the Irish were irresponsible and scarred Australia for over 50 years. Catholics were accused of being disloyal to the empire, of opposing the war against Germany, both of which were untrue. There were far too many who believed the unfounded allegations that came from Prime Minister Billy Hughes. Even in my lifetime I can recall people saying that Catholics are not true Australians because they owe their first loyalty to the Pope. That is not now said of Catholics but similar allegations are made against followers of Islam. The bitterness against Catholics was extreme and in some quarters has not entirely died. Those in charge of our affairs today seem not to understand this experience. There have been suggestions that this next election will be the Muslim election, as a while ago it was the Tampa election. Too many in positions of influence have used language that creates a divide between the rest of the community and Islam. While the Pauline Hansons of this world cannot be easily contained, there is certainly a responsibility on government not to repeat the mistakes and the errors made by Prime Minister Billy Hughes. The War against Terror is important, although it should not have been called a war because if terrorism is going to be overcome it will be overcome by wise policy, much better intelligence than we have had to this point and by good policing. But it is a threat and I do not want anyone to construe my remarks as denying that threat. Our strongest weapons against terrorism are our own principles and belief in liberty. We do not need to overthrow our principles. To the extent that we do, we give a weapon to the terrorist. In your mind prepare two lists. One, what should you do to maintain a broad based coalition in the fight against terrorism, of the kind open to President Bush after 9/11 and another list, what should you do if you wanted to reinvigorate the terrorist movement and drive the West towards a decades long war against Islam. On the first list I would have said to continue to act on our own principles, to maintain honest and open policies and to behave fairly to all people and to encourage strongly a peaceful resolution of problems between Israel and Palestine. Under current American policy that was never an option. The United States ran out of targets for its bombers in Afghanistan and then wanted a more emphatic demonstration of United States power and so it went to war in Iraq. President Bush's closest advisers, neo Conservatives, foolishly believed that it was within America's power to force political change in the Middle East and create a democratic Middle East in the process. Democracy imposed by force in Iraq would be followed by democracy in surrounding countries. It was from that point an aggressive war without analysis, thought or reason. The damage done to United States influence and prestige around the world has already been enormous and America still refuses to take the necessary steps without which an end to conflict will be impossible. An active, diplomatic engagement of all Iraq's neighbours is critical to a final resolution of this unhappy conflict. I am opposed to an arbitrary date being set for a full American withdrawal but only on condition that the diplomatic process is set in train. If it is not, continuing American military involvement will only lead to greater calamity, to greater disaster and to an even greater destruction of American reputation. The war in Iraq has made it extraordinarily easy for fundamentalist groups to recruit would-be suicide bombers to fill the ranks of the terrorist armies. But it is not only from Iraq and from Islamic countries that such recruits can be drawn. The West's attitude to Islam is now capable of being depicted as so antagonistic, so destructive and hypocritical that it is possible to raise recruits from countries such as the United Kingdom. When Prime Minister Blair says he has made Britain safe and the prosecution of the war in Iraq is fundamental to the preservation of British freedom, he shows how little he understands the consequences of his own action and the damage that war has done within Britain itself. It has also made it difficult for moderate Islamic Leaders to maintain their moderation, especially in the face of other breaches of principle by the West. President Bush established Guantanamo Bay to enable the United States to put prisoners alleged to be terrorist beyond the reach of the American legal system, beyond the reach of the Geneva Conventions and beyond the reach of any element of international law. By executive decree, he established Military Tribunals which the United States Supreme Court struck down on the basis that the President had exceeded his powers. Congress passed a law establishing new Commissions, a law that has not yet been tested in the Supreme Court. It is certain, however, that that law could not apply to American citizens because the Rules of Evidence allow evidence that would not be accepted in the normal civil or military justice system in the United States and, for that matter, would not be acceptable under the Australian code. The future of the Commissions probably rests on the judgment as to whether or not such laws can be passed in relation to non-citizens. Its Rules of Procedure are utterly inconsistent with the Rules of Procedure in the normal justice system of America or of Australia. The loose use of hearsay evidence and evidence obtained under harshly intrusive questioning is allowed. It is left to the President to define how far that intrusive questioning may go. This is the system established to try David Hicks and other people from Guantanamo Bay. In my view it was a system designed to achieve a guilty verdict on the basis of evidence that would be totally unacceptable if applied to American citizens or to an Australian citizen within Australia. The circumstances surrounding the Hicks trial, if one can call it that, and the plea bargain support that view. For around a year, perhaps for longer, David Hicks had been kept in solitary confinement, no access to the sky, to the outside, to other people, inadequate exercise, a lighting system controlled from without the cell and also, we are advised, temperature changes from extreme cold to heat, could be part of the regime. There were attacks on Major Mori and his credibility and the way he was conducting the Defence, all undertaken by the Prosecution, even at one point implying that Major Mori could be charged. At the arraignment proceedings itself, Hicks' civilian lawyers were barred from the process because they wouldn't sign a blank cheque agreeing to rules for the conduct of Counsel, which the United States Department of Defence had not yet drafted. These processes collectively were designed to put Hicks under intense mental pressure, perhaps for a very specific reason. While the United States Government, and for that matter the Australian Government, seemed to want, as Stephen Charles indicated, a guilty verdict, the evidence they had available, even after five years imprisonment, was weak and could not have been successful for a United States citizen in a civilian court or in a normal United States Court Martial. Justice Susan Crawford, Head of the Military Tribunals, struck out the more serious charges, including the charge of murder. It was the more serious charges that were used by United States personnel, by the Government of Australia, by the United States Ambassador to Australia, to suggest that that Hicks was amongst the worst of the worst. Quite recently the Ambassador said that Hicks would kill Australians and Americans without blinking an eye. There was only one charge remaining, that of providing material support for terrorism. The maximum sentence for that offence is reported to be seven years. This charge was corruptly imported from the United States civil system, it was retrospective in its impact and the particular law, because of retrospectivity, would not meet normal judicial standards. The United States authorities would not have wanted the weakness of their evidence publicly exposed, even in a fraudulent Military Tribunal. Even though cross-examination would have been extremely limited, it could still have exposed the secrecy by which evidence had been collected. The Defence would have exposed the fact that they were not properly advised of the evidence, of the means by which it was obtained, that it was in fact a very secret process, designed to achieve one verdict. If the process had gone to open court, each hour would have demonstrated that justice was not being served, that this was not a court of law. The best alternative for governments, with some semblance of their credibility preserved, was to have Hicks under such pressure that he would accept a plea bargain. This does explain the solitary confinement of over twelve months. It does explain the other pressures placed upon him, pressures which would have included the threat of continuing jail in Guantanamo Bay for twenty years or more. What person amongst us would not have accepted a plea bargain that achieved some element of freedom at the end of nine months? This is made all the more evident in the final stages of the Tribunal process. Ten colonels had been flown in from around the United States to determine sentence, they determined the maximum allowed for that particular offence, seven years, only to find within fifteen minutes that they had been ordered to participate in a total and absolute farce. Within fifteen minutes they learnt that there had indeed been a plea bargain and the maximum sentence was nine months, less than many courts would give for a drunk-driving charge. They learnt that the plea bargain had been consummated in Washington, by-passing the Prosecution, by-passing the Tribunal and its Judge two weeks earlier. Whatever this process reveals, no sane person can call it an exercise of justice. So David Hicks will be home by the end of the year, partially gagged. The gag order which was undermined by information provided to the British Government and subsequently published in his application to become a British citizen and subject to the same treatment as other British citizens formerly held in Guantanamo Bay. And so this story comes to an end but at what a price. The main story is not David Hicks. The main story is a willingness of two allegedly democratic governments prepared to throw every legal principle out the window and establish a process that we would expect of tyrannical regimes. That our own democracies should be prepared to so abandon the Rule of Law for an expedient and as I believe, evil purpose should greatly disturb all of us. But how many are concerned? Too many are not concerned because they believe that such a derogation of justice can only apply to people who are different, in some indefinable way. Only the other day I was speaking with somebody who quite plainly believed that Hicks deserved anything that was metered out to him because he was what he was, the Rule of Law did not need to apply. For somebody who has done terrible things, why does he deserve justice? That denies the whole basis of our system, the necessity of a civilised society which cannot exist unless there is an open, predictable justice system that applies equally to every person. David Hicks at the best was clearly a very foolish young man. He was terribly misguided and may well have done some terrible things. I do not know. But if our Government says he has had his day in court, he made a plea bargain, therefore he deserved what he got, it only emphasises its lack of commitment to the Rule of Law for all people. If the Government believes it to be expedient, we now know that it is prepared to push the Rule of Law aside. That is a larger issue than the tragedy of David Hicks. A number of Liberals have spoken out about these and similar issues in relation to asylum seekers or refugees, or people improperly treated in Department of Immigration detention centres. Too many have remained silent. Does silence connote acquiescence, acceptance or fear, being fearful of standing and saying what they know to be right? A Liberal who fails to recognise the central importance of these issues for the maintenance of a fair and just democracy, bears no resemblance to the Liberals of Menzies' day and to the Party that Menzies founded. We now have a growing number of people who appear not to matter to those in authority. Not only David Hicks, Cornelia Rau, Vivien Alvarez Solon. Not only our indigenous population who's problems seem low on the government's agenda, but increasingly refugees or potential refugees. We know the government sought to excise all of Australia from our migration zone. In the process the government would have broken a promise made only last year to keep children out of detention. This time it was going to be detention in some offshore prison. Out of sight, and the government would have hoped, out of mind. Because some members of the Liberal Party would not accept these changes and the Labour Party was prepared to oppose them, this particular legislation was withdrawn. These are groups which, under current policies, have no adequate protection under the law. The administration has avowedly pursued policies designed to deny access to the law to increasingly large groups of people. A civilised society is be judged by its adherence to the rule of law, to due process and the ease with which all people would have access to the law. It is judged by the way it treats minority groups. Australia would be judged badly. Today for a variety of reasons, but not least because the government has sought to set Muslims aside, discrimination and defamation against Muslims has been rising dramatically. Too many have taken the easy path and accepted the governments contentions that Muslims aren't like us and therefore it doesn't matter if discrimination occurs and if access to the law does not apply. We have forgotten that discrimination once it starts, spreads. This situation is already leading to increased discrimination against Jews. If we do not arrest it, it will spread from minority to minority. We would do well to heed the words of Israeli Professor Naomi Chazan in the recent Gandel Oration in Melbourne: "There is one standard and one standard for all, and the challenge that is posed by terrorism is how to defend the rights of those that we don't agree with? ... How can we defend the rights, the basic human and civil rights, of those whose ideas we simply abhor? It is the system, the process, the courts, it is the measurement of justice that determines the nature of our civilisation." Our reputation as a successful multicultural society is threatened. In other ways our legislators, both Government and Opposition, have transgressed. The new security laws, supported by both parties, diminish the rights of all Australians. I do not know of any other democracy that has legislated for the secret detention of people the authorities know to be innocent. You are not allowed to make a phone call. You cannot ring your wife or husband to say where you are. You just disappear. You are not allowed to ring a lawyer unless that is specifically conceded in the warrant for your detention. If you answer questions satisfactorily that's fine. If you don't, you can be prosecuted and go to jail for 5 years. There is a defence against that prosecution, if you can prove you never knew anything, it is not an offence, but how can you prove you did not know something if you don't even know what they are talking about? We do not know how much these laws are used because the law itself prevents any public reporting or discussion. There are many other things. We have control orders and preventative detention provisions reminiscent of apartheid in South Africa and which are almost certainly a serious error in the fight against terrorism. Both devices would forewarn any potential terrorist that a certain person has been blown. The cell or group would disappear. It would be better policy to continue surveillance, to collect evidence, hopefully to make a charge at a later point. Some aspects of the Control Orders appear to be utterly ludicrous and counter to our national security interests. As I am advised, one Control Order prevented somebody ringing Bin Laden. If we seriously thought that person might have been able to ring bin Laden, we should have allowed him to do so, collect more evidence and perhaps pinpoint where Bin Laden was. Last year there was been a report by a group, established by the government itself, to review the Anti-Terrorist Legislation. This review preceded and takes no account of later proposed changes to our refugee provisions. The review emphasised that recent events have had a profound impact on Muslim and Arab Australians. The committee points out that there is a considerable increase in fear, a growing sense of alienation from the wider community and an increase of distrust of authority. These concerns are more likely to lead to an increase in terrorist activity rather than in a diminution of terrorist activity. The review committee strongly recommends that efforts be made by government to combat these concerns. One of the themes of this speech involves the departures from the commonly accepted rule of law, which is the only real protection of civilised society. Another theme involves discrimination which so often flows out of departures from the Rule of Law. Unfortunately discrimination keeps spreading and is gaining a foothold in the wider Australian community. Such circumstances diminish Australian society. Unfortunately, if economically people are reasonably well off, and if there is a belief that these issues don't touch me, don't touch my family or my friends then it is easy to conclude that these issues don't matter too much. We should remember that as governments maintain support by playing on the politics of fear, so too they tend to exaggerate the fear and to expand the concerns of people. This process leads to a further exaggeration of fear and to further alarmist reactions. If current polices led by the United States are to prevail, supported as the United States has been by Britain and Australia, then we run two risks. A decades long war against Islam with the possibility of extraordinary destruction throughout the world, and the possibility that our government will build within individual Australians a fear and concern of Islam that will take decades to eradicate.